Curtis Bingham.com » Living Large–Without Power! 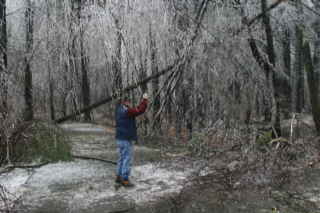 We’re still without power and don’t expect to have it restored before Monday. 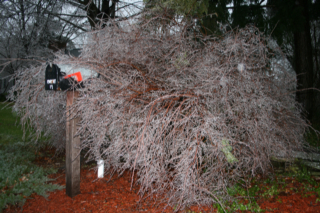 It has been billed as the worst ice storm ever to hit Massachusetts, and left 1.2M homes without power. 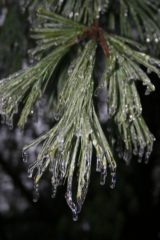 During the night we would hear horrendous POPs as pine tree limbs about 8″ in diameter would shatter under the weight of ice on the needles and crash downwards to the ground, often times taking other limbs with it. We saw electrical transformers explode on our street and then absolute silence as the hum of electrical devices or the dull roar of the boiler in the basement shut off. We awoke to a beautiful winter wonderland, with the sun glistening through the ice on the trees. 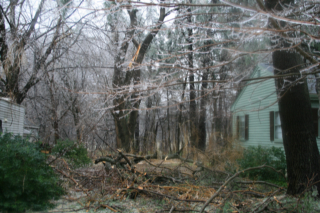 There were still occasional pops and thunderous crashes from overloaded branches crashing to the ground followed by a massive wave of ice shards tinkling to the ground like glass shattering from the 3rd and 4th stories above us. Not to be deterred by the lack of electricity, we pulled up our big 3-burner camping stove, plugged in the propane tank, and fired up the griddle. Within moments, we had golden brown pancakes, hot chocolate, crisp sausage, and perfectly cooked eggs. We invited our elderly neighbors to the breakfast feast and they were grateful to have something better than cold cereal to eat! We drove around a bit yesterday with our chainsaws, axes, and handsaws to help neighbors cut up trees that had fallen across their driveway. It was fascinating to wend our way through precarious tunnels of trees laying across roads, held up by power lines across the street. Last night the temperature dropped to 20 degrees, but we weren’t worried. I spent about 3 hours overhauling the generator I’d bought off of Craigslist about 5 years agod and hadn’t ever started. It took a good while to clean out all the sludge in the fuel tank and lines but at 7pm last night it roared to life, bringing with it the hopes of being able to save our freezer full of meat and maybe enough hot water for showers! As the temperature plummeted after the sun went down and having been out in 33 degree temperatures all day, the house was downright balmy at 58 degrees. I had promised the kids earlier during the week that we would celebrate a recent win in my business by watching a movie on Friday night and we’d all been looking forward to having a family movie night. Now that we had the generator running, it didn’t matter whether or not we had an extra TV and DVD player running, so we bundled up on the couch under a pile of blankets and enjoyed a family movie night despite being able to almost blow smoke rings at each other! The kids scavenged all the blankets in the house, built a fire in the fireplace and made a toasty warm nest in the living room. I realized as I prepared for bed that I would be forced to reclaim a few blankets they had stolen from our bed! I replaced them with the -20 degree sleeping bags we used last winter on camping trip to Maine where we camped out in snow caves. We woke up to 48 degrees in the house, which wasn’t nearly as bad as we’d prepared for. Another hearty breakfast cooked over the outdoor griddle, clean up the house, stack a bit more wood, and we’re good! It is amazing how much simpler life is without electricity. We slowed down our day yesterday with the waning sunlight, relaxed and read or told stories by candlelight, and then were ready for bed. Until the generator returned us to our media frenzy movie night! It is a time to count our blessings: the fact that we weren’t harmed by falling trees, we have the equipment and supplies to weather the colder temperatures without incident, we have food in our fridge and in our pantry, and a generator to occasionally run the heat and cool the freezer. It is a time to look out for our elderly neighbors, those who are normally very independent and hate to ask others to help them but won’t say no when we force warm food and offers of more blankets upon them. It is a time to be together as a family and remember what family is all about. We hope that others in worse shape than us will be blessed, and wish all of you the best of the best! 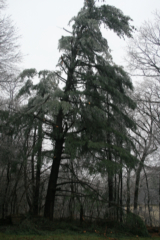 Posted: by Curtis N. Bingham, December 13th, 2008 under Uncategorized.